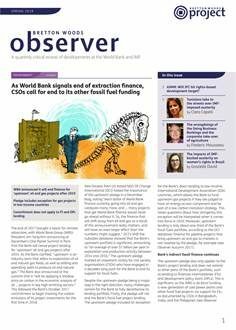 The World Bank and the Green Climate Fund: "an ironic contradiction"? Despite the Bank’s apparent reluctance, the GCF’s permanent trustee will now be chosen through such an open bidding process, with a final decision expected to be taken at the GCF’s 21st board meeting in Bahrain in October. The Bank has so far not commented publicly on whether it will respond to the open call, according to TWN. The Bank’s role as trustee of the GCF has been a source of civil society concern, given the Bank’s pervasive role in climate investment funds more generally (see Update 86; CIFs Monitor 14). However, Erika Lennon with US CSO Center for International Environmental Law (CIEL) noted that these fears have so far been allayed, commenting “in its role as trustee, the Bank does appear to act as merely keeper of the GCF funds, performing administrative functions and disbursing the money in accordance with GCF decisions.” In March 2017, meanwhile, 187 CSOs, including US-based Women’s Environment and Development Organization (WEDO) and the Philippine Movement for Climate Justice (PMCJ), wrote a letter to the GCF board calling for it to create a fossil fuel-free investment strategy, which would apply to GCF funds invested by the Bank in its role as trustee. In parallel to these discussions, the GCF and Bank signed an Accreditation Master Agreement at the UN Framework Convention on Climate Change (UNFCCC) 23rd Conference of Parties (COP23) in November 2017, which allows the Bank to implement GCF-approved projects. The recent GCF board meeting saw five Bank-supported projects approved, as part of 23 projects approved overall, representing over $1 billion in finance for climate change adaptation and mitigation projects.